Bacon on the beech: The Wizard Inn Alderley Edge. Everyone likes to go out to a country pub don't they? 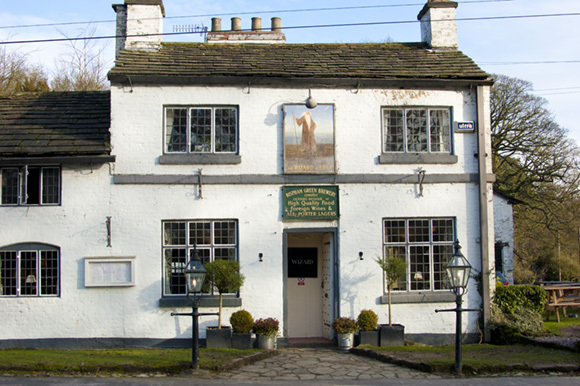 Over the last few years amongst others, we've enjoyed food at The Pheasant Inn at Higher Burwardsley and The Goshawk in Mouldsworth Cheshire, Oddfellows in Mellor, The Old Hall Inn, Chinley and more recently The Freemasons at Wiswell in Clitheroe. I found The Wizard when looking up local pubs with Michelin Bib Gourmand awards, it's been in the guide every year since 2001. So I and several friends went for a dog walk in Alderley Edge on a very cold January afternoon. We didn't go as far as we normally would do, it was just so freezing, and after just over an hour we took rescue in the cosy pub with our dogs. We were shown to one of the pretty little rooms in there. We ordered the Wizard's own real ale from a fella that looked like a young wizard in training. He couldn't help us with our beer choice however, as, "he'd never drunk beer in his life!" 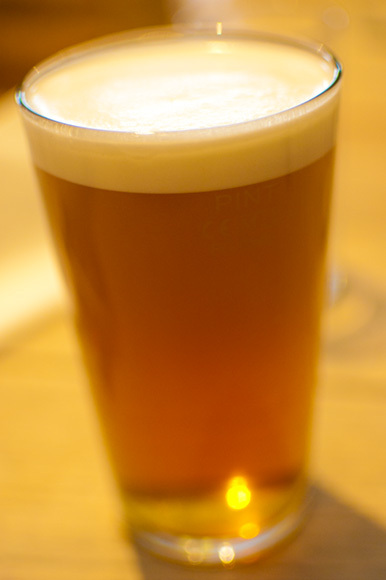 It was a good choice though, the refreshing hoppy pale brew really hit the spot. However, we swapped a planned starter for the White Onion Soup as I had caught sight of it on the way in, and it looked really good. 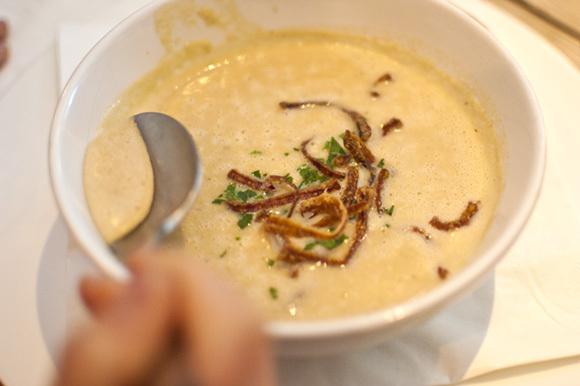 It didn't disappoint, hot, creamy and sumptuous with crispy thin strips of onion, it was the best soup we've had since the crab velouté at Kampa Park in Prague. 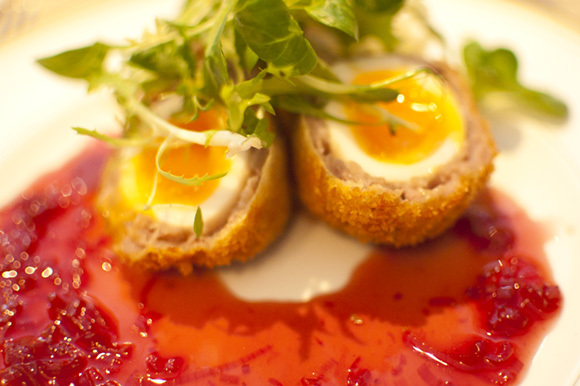 Mrs Bacon didn't really want to do our designated swap over, it was that good, but we still shared the Venison Scotch egg Cumberland dressing, Pickled cabbage, which look very pretty and tasted pretty good too. Had to put in a close up as it's so pretty. After a bit of a wait, our mains finally arrived. I knew the Slow Braised Ox Cheek with Mash, Chantenay carrots, Baby Onions, Bacon Lardons & Button mushrooms was going to be good, and so it proved to be. The meat cut like butter, it was so tender you could eat it with a spoon, I can't understand why more pubs don't do this dish, and it's apparently a sell out at Angela Hartnett’s restaurant. We also ordered a side of the smallest bowl of chips you've ever seen, but I decided to forgive them, as these weren't any old chips, these were Posh chips: Triple cooked, white truffle & Parmesan. You can pretty much smother anything in truffle oil for me, and I'll devour them like a hungry wolf. Mrs Bacon had to stop me before it was too late; "Oi! I've not had any of them!" There were three left. 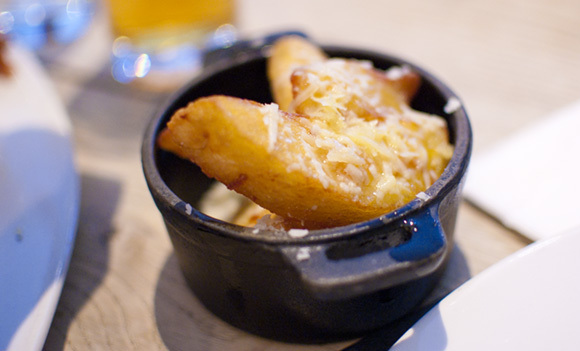 Posh chips: Triple cooked, white truffle & Parmesan. 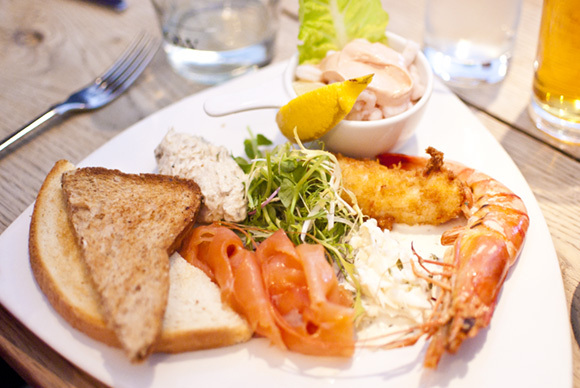 We also shared a fine Fish Platter - Prawn Cocktail, Peppered Mackerel Pate, Smoked Salmon, Garlic Crevettes, Cod fish fingers, Celeriac Slaw and Multi seeded bread. Fish Platter - Prawn Cocktail, Peppered Mackerel Pate, Smoked Salmon, Garlic Crevettes, Cod fish fingers Celeriac Slaw and Multi seeded bread. 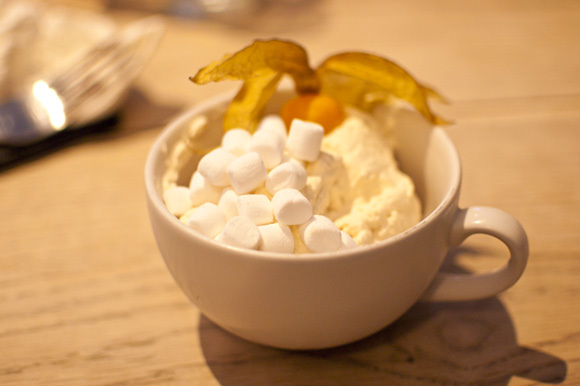 It took an age (35mins) for the desserts to arrive, and by this time my stomach had caught up with my head, and I could barely finish my Chocolate-Cappuccino Mousse & Marshmellows, as it was quite rich. My friend enjoyed the Chocolate brownie with Kirsch Cherries & Snugbury's ice cream and Mrs Bacon declared herself very pleased with her perennial favourite Sticky Toffee Pudding. 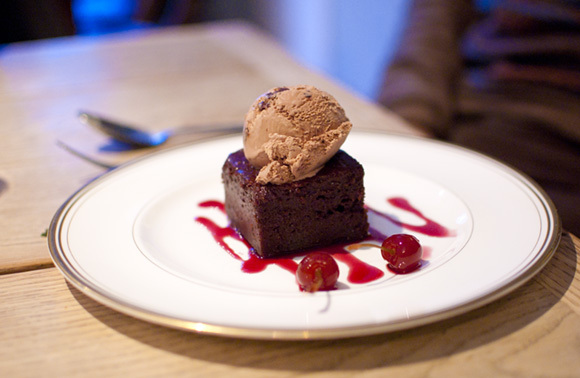 Chocolate brownie with Kirsch Cherries & Snugbury's ice cream. We all enjoyed The Wizard immensely, the food is very superior gastro pub style, and although the service was quite slow, we got a friendly welcome and it did not spoil an enjoyable afternoon doing what we do best; eating, drinking and chatting. 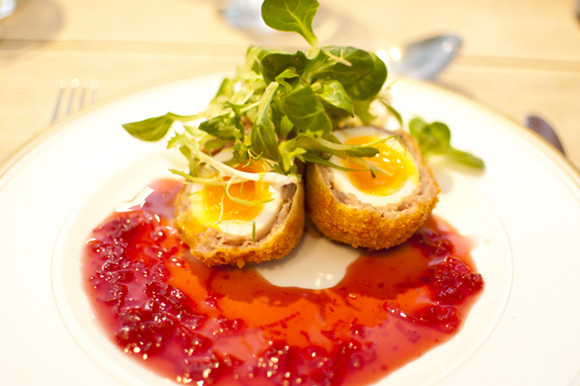 Price: About £35 pp for starters, mains, dessert, 2 beers and coffee. Service: Friendly, but quite slow, they were understaffed. Atmosphere: Warm and very classic. 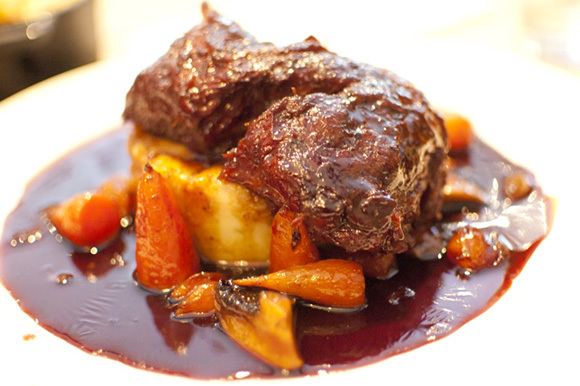 Star dish: Slow Braised Ox Cheek. *Note marks are judged against those in the same category eg, pub, fine dining, cheap eats etc.